Having always lived on a ranch, "spring" and "branding" are words that just automatically go together. As a little girl I helped my mom get branding dinner for up to 100 people as we branded almost 1000 calves each May. All of the neighbors and family came to help so that number included not only the cowboys, but the women and children as well. Mom always cooked the meat, potatoes and dinner rolls, and the neighbor women brought salads and desserts with them when they came to spend the morning visiting and helping. 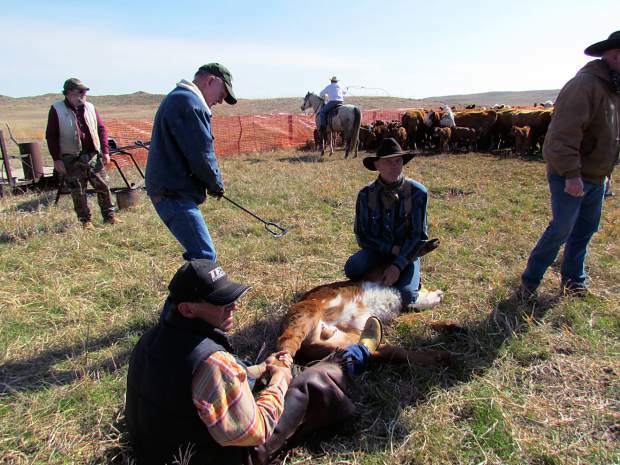 It was always a great time of socializing, as well as working together to feed the large crew needed to brand the spring calves. The men and older children would begin arriving at daybreak to begin rounding up cows and calves. About mid-morning the women would begin arriving to help Mom. As soon as I was old enough (about 12) I was in charge of taking the mid-morning homemade cookies and/or doughnuts and coffee out to the corrals for the working crew and getting a count of how many cowboys were there. We branded in three different places so it varied from year to year where I might find the work crew. Back at the house we had already set up tables and chairs in the shop. When I got back from the branding corral I made sure there were salt and pepper shakers on each table. By then Mom usually had another list of things for me to do! 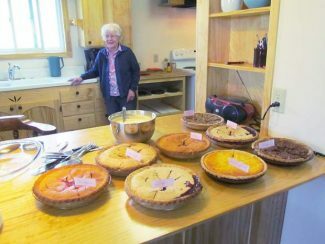 After the men came in the house and had washed up they went through the line and heaped their plates high with roast beef, mashed potatoes and gravy, fresh vegetables, salads, and homemade rolls with fresh churned butter and homemade chokecherry jelly. As they left the house through the porch I handed them a glass of iced tea or a cup of coffee and they made their way to the shop to sit and eat and catch up on what the neighbors had been doing since the last branding. Most made another trip to the house for pie and ice cream or one of the other delicious desserts, or maybe another plate full of food. As the men got through the line the younger children and then the women filled their plates and settled in to eat and enjoy each other's company. With that as a background, fixing branding dinner after getting married should have been a piece of cake! My husband Roy and I didn't start out with very many cows so the numbers were nothing like at my folks. For our first branding back in the spring of 1979, here in the Sandhills of southwestern Cherry County, we only had a crew that numbered about a dozen people. I made one big mistake that first year of branding dinner- I didn't serve beef! What was I thinking?! We had an excess of chickens that year so I fixed a large pot of homemade chicken and noodles with mashed potatoes and all the trimmings. Boy, did I hear about it, and you can be sure I did not make that mistake again! For the next several years I made homemade pizza for the crew, as we always branded in the afternoon and fed supper. It worked for us because I taught school and could make the pizza when I got home. When we started getting more cows and I had to change the menu, (12 pizzas were just too many) we had several of the crew jokingly tell us that if I wasn't going to make pizza, they weren't going to help! As our herd grew so did the branding meal. Just a few short years ago, we had between 45 and 50 people here, including the crew at the corral and all of the "extras." By that time, I was gone all week teaching school away from home, so we scheduled branding day for a weekend in late April. I started ordering beef roast from the local grocery to be cooked, sliced, and warmed in the broth the morning of branding. There were some years that without my daughters and/ or daughter in law, here at the house with me, I would have been alone fixing and serving the meal. The potatoes, dirt cake, strawberry salad, and dinner rolls were all made ahead of time and frozen. I do not know if it is just the changing times, or what exactly, but in our area the neighborhood men continue to exchange branding help, however, the women do not seem to use the day for a social gathering like I remember as a child. Changing times have brought changes to our branding style and now we brand several times in small bunches. We do not have the younger cowboys in the neighborhood anymore for wrestling calves and the ranchers all have their own feeding and calving cows to care for. We fix a meal for only eight to 10 guys, but we do it five or six times. Our meals now consist of a casserole, salad, vegetable, and dessert. One casserole that is requested often is the cavatina that my daughter Kari makes. My wonderful mother in law, currently 98 years old, has always been in charge of making pie. A few years ago she has passed that torch to Kari, who carries on the tradition of branding pie, to go with the dirt cake at the Westover's. Our ranch, Gem Valley, LLC is located north of Hyannis, Nebraska or south of Gordon, Nebraska in southwest Cherry County. Roy grew up on this ranch and we have lived here since we were married in 1978. As a young couple we spent the summers on my parents' ranch, east of Highway 61, working in the hayfield, doing our own haying here, and then going to college in Chadron during the winter. When we finished college in 1984 we returned to the ranch full time. For over 20 years I taught school in one room country schools. I then became the principal of Cherry County rural schools during and after the consolidation of those schools by the state legislature. I retired from that position in 2011 to return to the ranch for health reasons. Our youngest daughter Kari, her husband Nathan, and their two small boys Greyden and Griffyn live with us here at Gem Valley. Roy's mother, Irene, also lives here on the ranch. At 98 years old, she is a true example of the pioneer spirit which settled these hills, as it is her family that first homesteaded this ranch clear back in 1885. It has been ranched continuously by family since that time. With four generations of us living and working here at Gem Valley, we consider ourselves a truly blessed ranching family of the Sandhills. Crush cookies – put ½ in bottom of 9×13 pan. Mix cream cheese, butter, & powdered sugar and fold in whipped topping. Mix pudding with milk and vanilla. Stir into cream cheese mixture. Pour over crumbs. Top with remaining crumbs and put in freezer. Mix all in large bowl. Pour into lightly greased deep foil 9×13 pan. Top with 2 cups shredded cheese. These may be frozen ahead. Put in 350* oven for 2 hours or until brown and bubbly. Put flour in large Tupperware bowl and make a well. Cool milk with water. Add sugar, eggs, salt, and yeast. Put in well and seal. When lid pops or in 2 hours add butter and work well. More flour may be needed. Seal again. When lid pops or in 2 hours make rolls. Let rise 20 minutes and bake at 375* for 30 minutes or until tops are golden brown. This makes a lot of rolls and is good for cinnamon rolls as well.